If there is no gap for a conventional row-batching barrier to enter, then alternative techniques are required to separate the product flow into separated rows. The ‘Marshalling Roller’ consists of a carefully speed-profiled nip roller, which works in combination with the conveyor on which the product is being carried, to generate a realigning action (showed running slowly) above. 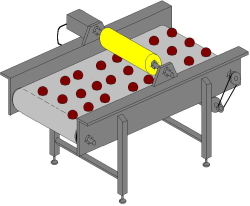 By appropriate control of the nip roller’s speed profile, product can first be held back (by rolling it backwards against the conveyor motion), and then ejected (by a rapid movement with the conveyor). This pattern of holding and ejecting can be made cyclical to gather product within a particular time window, and eject it at a pre-determined time, for example to provide equally spaced product, phased to match downstream processes. 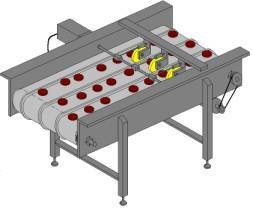 Multiple lanes of product can be aligned simultaneously with the same ‘Marshalling Roller’. The precise details of the speed profile are key to optimum re-alignment, and they are a complex combination of the product, process, mechanical and dynamic characteristics (a rigorous method for devising the optimum speed profile for a given situation forms part of Crafty Tech’s patent protection). There are currently two embodiments of this re-alignment principle, one for handling near spherical or cylindrical products, and second for discs, where the product lies flat on the conveyor belt and is rolled against raised upstands by the edge of speed profiled discs extending down between lanes. There are also skidding versions of the technique which can be applied to multiple lanes of robust non-rollable items, which uses a differing algorithm to generate the appropriate nip roller speed profile. The ‘’Marshalling roller’ was one of a number of patented product handling systems launched by Crafty Tech at the ‘Excellence in Food Manufacture 2004’ Conference at PERA in October.